Every once in a while, someone jolts me out of my comfort zone - and makes me question what I'm doing. Dan Waldschmidt, author of the new book EDGY Conversations, is one person who always seems to do that. He's spent the past four years studying how ordinary people were achieving success against all odds. I hope you enjoy my interview with him. JILL: Dan, EDGY is an acronym that stands for the four behaviors that high performers use to produce outrageous results. Tell us about them. Dan Waldschmidt: Sure. After studying 1000 high performers, we saw that they were Extreme in their beliefs and behaviors. They demonstrate a maniacal focus and Discipline for getting things done. They are Givers - intentionally and almost automatically. And they understand the (Y)Human side of life - instead of just expecting everyone else around them to be logical, they understand how pain, fear, and failure impact those around them. While each high performer we looked at had clear, distinctive ways that they excelled above their peers, they all share these four qualities. All of them were extreme, disciplined, giving, and human. JILL: Why talk about attitudes and philosophies instead of a series of “steps” that people can follow? Aren’t “steps” more practical? Dan Waldschmidt: The right attitudes create outcomes that are unpredictably magical. By changing your attitude, you free yourself to explore ideas that otherwise would have just been unthinkable. The “right” actions will always change, but developing the right attitudes have a timeless impact. That's why we focus on helping readers achieve better attitudes. JILL: What are a few practical lessons you learned from your research in writing the book? Dan Waldschmidt: High performers ignore a great deal of advice. Some comes from people they love. Other advice is criticism from people who “know better” and are happy to tell them that what they’re doing “isn't going to work”. High performers don't spend time reasoning with doubters, they just continue moving forward towards where they want to be. High-performers believe that achieving audacious dreams is rooted in hard work. They're relentless about putting in the sweat equity that their dreams deserve. JILL: What is one thing that an ordinary person trying to achieve to outrageous success should start doing right now? Dan Waldschmidt: EDGY is a mindset change. An attitude change is the single most important thing someone can do right now. If there is one thing that you can do to change your life for the better it begins with brutal honesty about who you really are. Not what you are doing or what have you done in the past. Who are you? What are your motivations? Lying to yourself is a dangerous trap. It’s the biggest reason why ordinary people stay ordinary. They spend time making excuses and pretending like they are doing everything right instead of improving. JILL: How does this apply in a business setting? Dan Waldschmidt: The word “edgy” might seem out of place in a business setting, but the principles are applicable, none the less. Standout companies have radical beliefs. Great leaders demand accountability. They measure progress and change course in order to drive better results. Growing, vibrant companies give more value than people pay them to give. They don't trade long-term growth for short-term tricks and manipulation. Being a little bit more “human” is a life skill that will make you an infinitely better business person. Compassion, insight, and thoughtfulness are endearing and attractive qualities to everyone you encounter. EDGY has a big place in the enterprise. The principles are timeless. JILL: Thanks so much, Dan. You're kicking our butts! 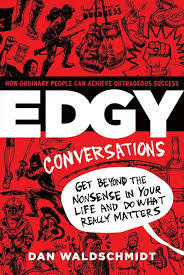 And readers, click here to get your copy of EDGY Conversations. It's filled with great stories that will inspire you to achieve more than you thought possible. 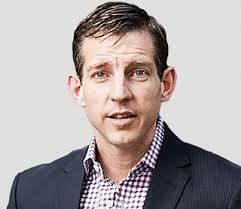 Dan Waldschmidt is an international business strategist, speaker, author, and extreme athlete. His consulting firm solves complex marketing and business strategy problems for savvy companies all over the world. Dow Jones calls his Edgy Conversations blog one of the top sales sites on the Internet. He’s been profiled in Business Week, INC Magazine, BBC, Fox News, The Today Show, and Business Insider, has been the featured guest on dozens of radio programs, and has published hundreds of articles on progressive business strategy. He is author of Edgy Conversations: How Ordinary People Achieve Outrageous Success.